A charming pictorial map of old New Orleans. Le Vieux Carre de la Nouvelle Orleans. 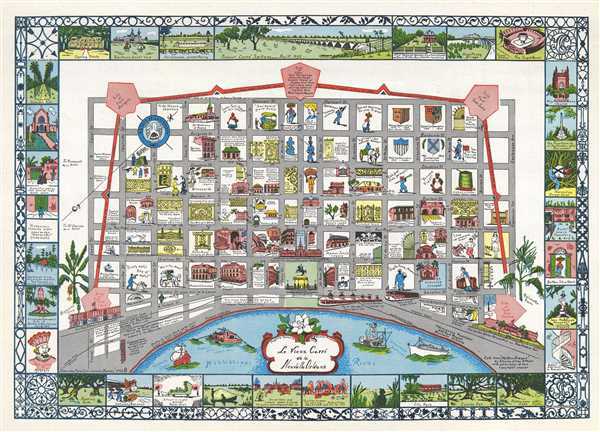 This is a charming 1942 pictorial map of New Orleans, Louisiana. It covers the original fortified settlement of New Orleans along the Mississippi River and inland as far as modern day N Rampart Street. Individual streets are noted, with buildings, fortifications, landmarks, historical sites, places of interest, activities, etc. illustrated beautifully. Historical facts and events are noted throughout. Near the Mississippi River, the map notes the original levee, the waterline as in 1720 and the present waterline. Steamboats and sailboats are seen cruising in the river. The map proper is surrounded on all side by vignettes of additional historical events and landmarks. An ornate wrought iron border encompasses the whole, with the four corners representing the designs on famous buildings. This map was drawn by Myra Zimmerman Barnes in 1942 and issued as part of the 1955 edition Old New York, by Stanley Clisby Arthur. Arthur, S.C., Old New Orleans, 1955.